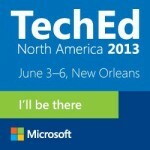 Yesterday was the last day of the TechEd North America 2013. It was my first visit to TechEd North America and it was a great; I not only got to meet lots of interesting people in real life, the sessions were also excellent. The hosting city of New Orleans contributed a lot to the total experience with friendly people, nice music and the Cajun kitchen. Now, for your convenience I put down a list of all UC related sessions; note that you can find an overview of all TechEd NA 2013 sessions here. Microsoft Exchange in the Cloud: scared of losing your job? The New Outlook Web App: Designed for Touch and Offline Too! This entry was posted in Exchange, Office 365, Skype/Lync/OCS and tagged Event by Michel de Rooij. Bookmark the permalink.